Google is well known for including fun little surprises in your search results, and today, I discovered a fun new one: A Google Pride Month Easter egg promotes the celebration of the LGBTQ community with a delightful rainbow. I'm a self-proclaimed tech nerd, so one of my favorite parts about using Google is finding those secret Easter eggs; yes, I fell in love with the seach engine when I discovered I could "tilt" my computer screen by typing "tilt" into the search bar, and yes, I absolutely lost it when I realized you can hear the noises animals make when you search for "animal noises." Who doesn't need to hear an adorable cow moo on occasion, am I right? In my personal opinion, however, Google's new Pride rainbow Easter egg takes these surprises to another level because it combines a fun surprise with an act of inclusivity. Though there have been major strides forward in terms of progress for the LGBTQ community, such as achieving marriage equality and the repeal of Don't Ask, Don't Tell, for example, there is still much work that needs to be done. The LGBTQ community remains a minority population suffering from systematic and structural obstacles, such as a lack of housing and employment protections. So, every summer, LGBTQ people and allies celebrate Pride Month, which serves to raise awareness of the queer community. 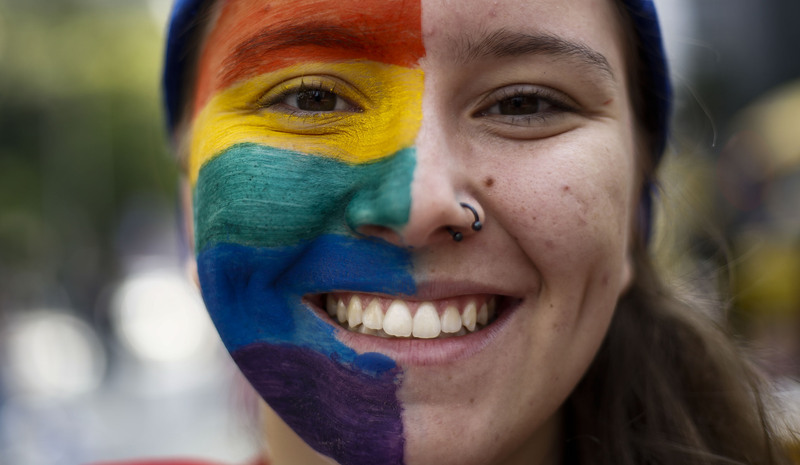 Pride Month is typically when major events, like the Pride parades, take place; June is also a popular month for LGBTQ film festivals, community building events, and activism for the community. Look at that awesome rainbow! Mary Emily O'Hara over at The Daily Dot suggests that the Pride Easter egg is based on the quantity of searches for Pride festivals, which is a theory that makes a lot of sense to me. However, I'd still love to see the Pride flag appear for all related searches as a way of boosting education and inclusivity — LGBTQ communities exist everywhere, even if their presence goes mostly under the radar in some areas. Pride festivals and events are gaining traction outside of the typical urban, city environments, as well, and are appearing in small towns and conservative areas across the country. Still, progress is progress, and I'm excited to see that Google continues to support the LGBTQ community.